The defending President's Cup Champions had 3 games in 3 nights this past weekend, and the results were less than impressive. The Stallions traveled the Markdale on Friday, hosted Markdale on Saturday, and headed to Quebec to take on the Maniwaki Mustangs on Sunday afternoon. Friday night saw The Herd battle back on 3 separate occasions to take a thrilling 6-5 victory over the Grey Highlands Hawks. Goals scored by Tim Holmstrom (2), Jake Mortley (2), Alex Wahlstrom, and the game winner on the PP by Jacob Ljungstrom! Ethan James got the win for the Stallions. "The boys battled tonight. Didn't give up when we were down 3-0. They showed great resilience the entire game, didn't quit and we came out on top. We got some bounces that went our way, and we were good enough to capitalize" said Head Coach Sylvain Cloutier. "We could've folded and mentally shut down and moved on to our next games. Instead the boys stayed up, didn't turn on one another and fed off the momentum they built up through the 2nd and 3rd periods. Very proud of how we handled everything." said General Manager and Assistant Coach David Lang. Saturday night however, did not show the same story. Undisciplined penalties, poor play, and lack of effort would haunt the Stallions for the night, as they would fall 3-1 (Empty Net) to the visiting Grey Highlands Hawks. 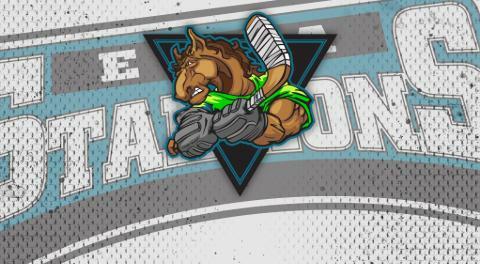 Lone Stallions goal was scored by Tim Holmstrom. "We didn't have it tonight. Undisciplined all night. Both in terms of penalties as well as our play. Can't win hockey games when you play like we did tonight. Not much else to add to that. We need to be better" added Cloutier. "Perhaps all of the emotion from last nights comeback win came back to bite us, I don't know. All I know is that we will work harder, get better, and move on" he added. "I thought it was bad from the get-go. I felt like we played like a bunch of individuals out there. No team game, no heart from the boys. Games like this is what we look forward too. We weren't ready for it, or them and we got outplayed" said Lang. Sunday marked another long day of travel for The Herd, as they headed to Quebec to take on The Maniwaki Mustangs. Ultimately the boys would fall 4-3 in OT. Goals scored by Tim Holmstrom, Jake Mortley and Jerry Pan. "I thought we had one of our best 1st periods of the season tonight. We were doing everything we are supposed to. Then for the next 40 minutes, we got away from that which ultimately lead to us losing the game" Cloutier said. "We know its a tough schedule, and we were hoping for 4 pts out of a possible 6. We got 3 of them. Can't hold our heads, long season, long way to go" Cloutier added. "Obviously we would like to get all the wins, 44 of them. But that's not realistic. Do we have the team to do it? sure. This is one of the best skilled teams we've had. We need to be a cohesive unit, and stop playing like individuals. The adage of "PLay for the name on the front of your jersey, not the one on the back" is so cliche but so very true. We need to put the effort in as a team. Row the boat in same direction if you will...together" Lang said. The team will have a good week of practice, and have to focus on another 3 games in 3 nights, as they travel to take on the Wexford Raiders on Friday night, host the Wexford Raiders on Saturday night, and travel to Brampton on Sunday night, to take on the Royals.